8. When is Mid-Autumn Festival? With thousands of years' development, Chinese cuisine and drink are indispensable to its culture, presently enjoying world-wide fame and a positive reputation. During a long period of production and living practice, China has made great contribution to the world on the aspects of food resource exploration, diet treatment, nutrition and health care, dishware design and cuisine aesthetics. Intellectuals in China have created countless dishes with apt names, aromas, flavors and colors, greatly enhancing the dining experience. During these four or five thousand years of development, Chinese cuisine appears various features in different periods and regions. Generally speaking, people in this country mainly live on the five common cereals and vegetables and added by a small supply of meat. This eating habit is formed by the mode of production which is centered by agriculture. 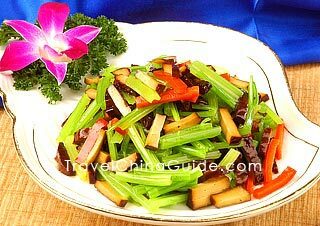 Moreover, Chinese food makes cooked and hot food primary, which is related to the advance of culinary skills and early civilization of the country. With a profound history of over 4,000 years, Chinese tea is regarded as an exquisite art form that requires sampling. Now it has become the national drink and one of the three soft drinks in the world (the other two are coffee and cocoa). It is from China that the tea planting techniques, processing, drinking methods and ceremony were directly or indirectly introduced to the world. 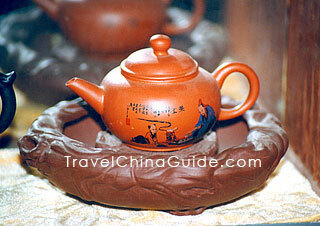 So China is regarded proudly as the hometown of tea. The land can be divided into four growing regions: South China, Southwestern China, and Yangtze River's north and south banks. These vast planting areas widely grow various kinds of tea trees. Each kind requires unique tea sets to infuse the best flavor. The sets mainly include tea cup, pot and saucer. Their materials differ in porcelain, pottery, lacquer ware, glass, bamboo and wooden fish stone. What's more, tea ceremony is considered to be a good way to cultivate the minds. Through infusing, appreciating and tasting tea, people can nourish their inborn nature and promote friendship among each other. Alcohol may be featured at sumptuous banquets to ease the expression of diners' thoughts and feelings. But in the long process of Chinese history, it is not only an objective existence but also a cultural symbol. China is one of the earliest countries in the world to make alcohol and the history can be traced back to prehistoric times. Since its appearance, it is not just a kind of drink, but is also endowed with spiritual and cultural value which reflects in social political life, literature, aesthetic idea and manner of life. From this point of view, to drink alcohol is actually to taste a culture. According to the historical records, as early as in the Shang Dynasty (16th - 11th century BC), Chinese people began to drink alcohol and use it to worship Gods. 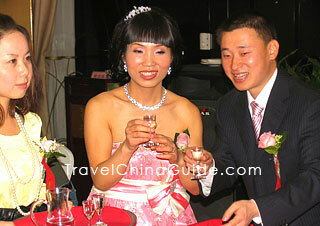 All kinds of alcohol except yellow rice wine developed greatly after the Han (206BC-220) and Tang (618-907) dynasties. Chinese alcohols have a wide variety of kinds. By the type of products, they can be divided into yellow rice wine, white wine, medicinal liquor, fruit liquor and beer. By the alcoholic content, they can be grouped into strong alcohol liquor, medium alcohol liquor and low alcohol liquor. In recent years, Chinese wine-making industry is prospering every day. Through thousand years of development, alcohol, as a basic necessity in people's life, has already melted into the resplendent Chinese civilization.